What are the benefits of cork flooring? I found this article on it in the news, we are looking for new flooring, but wanted to get your perspectives on why one might choose cork over hardwood or laminate? Cork flooring is a good alternative to hardwood or laminate if you are looking for an eco option flooring. Cork is a renewable resource and can be harvested every nine years. It comes from the bark of a cork oak tree. Cork is also comfortable under foot, a noise reducer and a healthy floor choice. 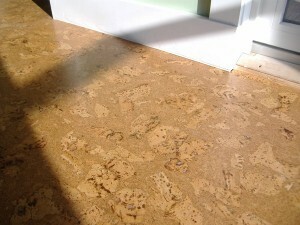 Cork flooring has a natural shock absorbing quality that is sought out. Cork is great in kitchens and any area where you stand for long periods of time because it reduces fatigue on your feet, legs and back. The shock absorbing quality comes from its cellular structure. Another thing that cork’s cellular structure helps to diminish is noise. Because of all the air pockets cork will help stop noise from traveling, unlike laminate and tile flooring. Add to these qualities that cork is also a natural anti allergenic and you have a floor that would work great in anyone’s home. Because cork is a natural product and an eco option flooring, most cork floors are low or no VOC (Volatile Organic Compounds). The natural properties of cork itself and the coatings used to seal it are healthy for any member of your house! With all of these features why wouldn’t you want to put cork in your home? It can be more expensive than laminate flooring, but in the long run it may be more durable. Remember you get what you pay for you. Cork is a great flooring product and doesn’t get enough credit!